Last updated a month ago by motdotla . Dotenv-expand adds variable expansion on top of dotenv. 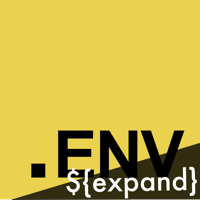 If you find yourself needing to expand environment variables already existing on your machine, then dotenv-expand is your tool. As early as possible in your application, require dotenv and dotenv-expand, and wrap dotenv-expand around dotenv. See test/.env for examples of variable expansion in your .env file.